The wishbones have now been cleaned and treated with rust converter, the bushings changed, just need some paint. The front panel, springs, and several small bits were cleaned, treated and painted flat black. Water pump, fan, fuel pump, carburetor, alternator and starter are in place, but not hooked up yet. No change on fenders, hood, lights, steering box and linkage, radiator, interior or brakes. We lost some time on the clutch and gearbox linkage. Several severely worn links had to be restored/replaced, and we had to drop the transmission and clutch to do so. [Update 2] We installed the lower control arms along with the new shocks and refurbished springs. [Update 3] Upper control arms, axles, and front sway bar installed. Front panel assembled, new mounts for front panel modified to fit the car (ordered rubber mounts from Rockauto, seemed to be for another car, but mostly usable). I removed the front panel again for now. 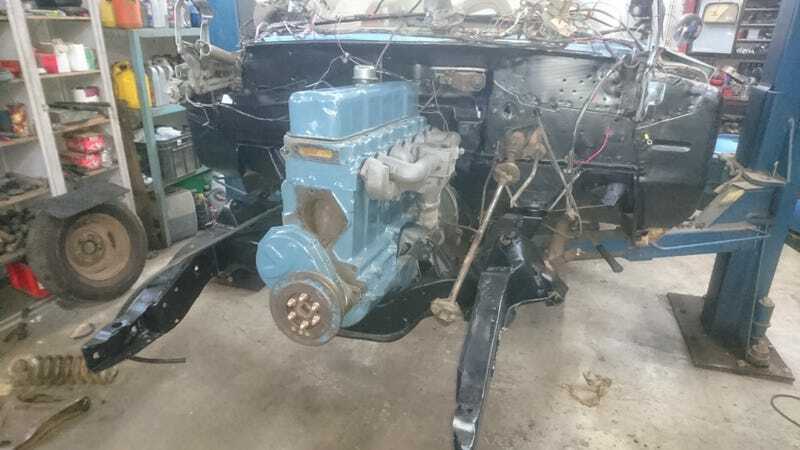 We also started (barely) the engine yesterday, noticed an oil leak in the oil feed line to the rocker arms, so that needs to be fixed, one step forward, two steps back. It runs ok, but since it has no cooling and “manual fueling” it didn’t run for long. Also ignition and carburetor need to be tuned obviously. [Update 4] Small progress this week-end, the steering and brake drums are painted and installed. The oil leak in the feed line is repaired. The fuel line is installed, so it gets it’s fuel from the tank now. The idle is pretty stable, but it still needs a bit of tuning and a cooling system so we can let it run for more than a few seconds at a time. The wiring should also be done, we still start the car by shortcutting the starter with a screwdriver. We put the wheels on it and pushed it out to free the hoist for the Pajero (which will have a seperate post). The back seats are in again also, and tomorrow the front bench should get in. Slowly but surely, it gets close to being a car again.